Image: Amazon Studios, Marvel Studios, Clay Enos. Design: Ashley Britton/SheKnows. Just when the winter doldrums are setting in and the holiday glow starts to fade, it may feel like there’s not that much to do — but think again, because with awards season kicking off in the first months of 2019 (starting with the 2019 Golden Globes on Jan. 6), it may be best to get a head start and catch up on all the nominated movies and TV shows you may have skipped over the last year. 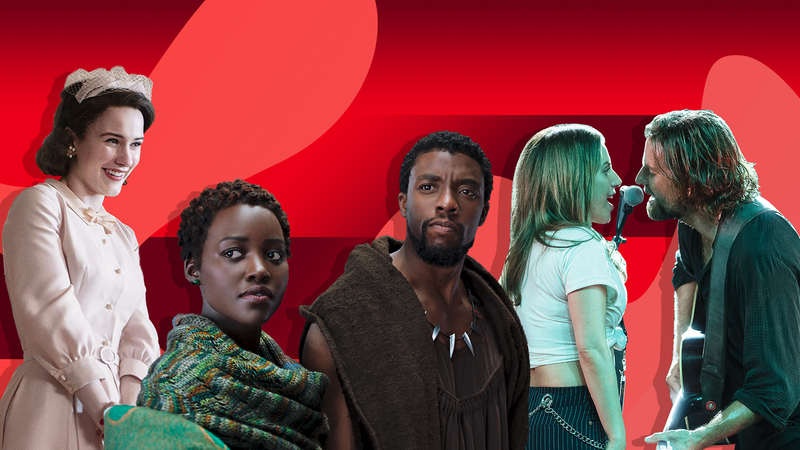 With that in mind, we’re going to tell you how you can watch some of the hottest awards season contenders, including movies like A Star Is Born and Black Panther, and TV shows like The Marvelous Mrs. Maisel, Barry, The Good Place and This Is Us. So grab some cocoa and curl up with a blanket, because these movies and TV shows have your name written all over them. No list would be complete without Bradley Cooper and Lady Gaga’s stunning remake of this beloved classic, which is getting buzz for best picture, actress and actor nominations. It’s a film that does so much more than provide a great soundtrack. It updates a timeless story and surprises us with how relevant it still is. As Cooper’s directorial debut, it will be truly remarkable if he also receives a nod for that role, but there are stronger competitors in that category this year. The film is still showing in a few theaters and is expected to be on iTunes and on demand Jan. 15. The story of a girl finding out just who her true love really is was adapted from the best-selling novel by Kevin Kwan. It’s a story that translated across cultures and raked in the biggest box-office haul for a romantic comedy in a decade with $238 million. Look for it to show up in the best picture and best director (for Jon Chu) categories. It’s currently streaming on iTunes and other on-demand services. The Academy discussed making this the year they instituted a best popular picture category for which Black Panther would have been a shoo-in. As it is, the film is still expected to land in the best picture category and possibly pull a best supporting actor nomination out for Michael B. Jordan. Ryan Coogler should also be nominated as best director, but he’s not receiving much buzz yet. The movie is available on Netflix and other on-demand services now. The story of the first man to walk on the moon stars Ryan Gosling in a turn that is creating strong rumors of best actor nominations. It could also show up in best picture, director (for Damien Chazelle) and visual-effect categories. The movie didn’t do well at the box office, but that could be owing to a more-than-two-hour run time than any fault with the film itself. Definitely worth a watch for the incredible story and to catch performances by Gosling, Claire Foy as Janet Armstrong and Jason Clarke as Ed White. Expected on iTunes and on-demand services on Jan. 8. This story, so hard to believe if it weren’t true, got rave reviews both across the festival circuit and from theatergoers in 2018. The story of Ron Stallworth, the first Black police officer on the Colorado Springs police force and who infiltrated the local chapter of the KKK, is told by talented actors including John David Washington, Adam Driver, Laura Harrier and Topher Grace, all under the tutelage of the legendary Spike Lee. A movie as full of humor as it is hard message, it’s well worth the time to find it on iTunes, YouTube Movies or on demand. This adaptation of a James Baldwin novel is still in theaters and already getting early buzz for best picture, best director for Barry Jenkins and best supporting actress for Regina King. The film follows the tale of a young woman looking to clear her husband’s name after he is wrongfully arrested for a crime he didn’t commit and is the directorial follow-up to Jenkins’ Oscar-winning Moonlight. It’s still in limited release, so it normally wouldn’t hit on-demand services until late spring, but look for it on streaming services as part of pre-Oscar film selections. Who doesn’t want to relive one of the best eras of children’s television through the documentary story of Fred Rogers? This feature is the most successful biographical documentary ever and follows the rise and charming life philosophy of Rogers as he created the incredible neighborhood so many of us grew up in. A lock for best documentary categories, this will be a tough one to beat. Look for it on iTunes and on demand now. It was a long time coming, but this follow-up to 2004’s story of an animated superhero family was well worth the wait. It showed us a side of Mr. Incredible we didn’t know we needed to see and set things up for another sequel in which the more-developed character of Jack Jack plays prominently. A best animated feature nod is sure to come along with a slight possibility of best picture. It’s on iTunes and on demand now. Landing on the American Film Institute’s 10 best films of 2018 list, this sleight feature about an anxious middle-school vlogger might be easy to overlook, but it shouldn’t be missed. With strong acting and a disarming examination of growing up in Generation Z, it’s an important window into challenges being faced by young people everywhere. Considered a strong contender for best original screenplay for first-time filmmaker Bo Burnham, it’s available on iTunes and on demand. One of the few TV shows made from a podcast, this psychological thriller tells the story of a character’s role in a shady military transition center. Star Julia Roberts is expected to pick up a best actress nomination, and the show is a contender for best drama. Season one is streaming on Amazon Prime Video. Midge Maisel is back for another season of her patented fast-talking comedy that takes no prisoners and leaves the room in an uproar. Star Rachel Brosnahan picked up the best comedy actress Emmy and Golden Globe in 2017 and is a strong contender again this year. The show could also repeat it’s best comedy series win at both award shows. It’s streaming on Amazon Prime Video. This BBC adaptation of a novel by Luke Jennings follows Jodie Comer and Sandra Oh through a maze of espionage and assassination. The Guardian said the script-writing is so taut, “[E]ven the second-stringers can pull off self-reflexive jokes.” There’s the possibility of Oh or Comer picking up acting nominations, but it’s definitely considered a favorite for the short list of best dramas of the year. You can find it streaming on Hulu. This may finally be the year The Americans gets its due. It has never been nominated for a series Golden Globe, but in its last season finally made the list this year alongside acting nominations for stars Keri Russell and Matthew Rhys. The story of two KGB sleeper agents in the U.S. has long been an audience and critical favorite, and once you start watching, you won’t be able to turn it off. Watch now on Amazon Prime Video. For everyone afraid the death of Jack meant the death of the show, season three proved there is so much more goodness to go around among this epic ensemble cast. Expect nominations for the entire cast, including Sterling K. Brown and possibly Milo Ventimiglia. The show should also repeat for best drama nominations at several award shows. It’s streaming now on Hulu. The fifth actor to play the fictional Jack Ryan finally brought the character down to the small screen, where the show saw tremendous success among audiences. John Krasinski plays the CIA analyst-turned-field agent and brought a fresh take to what could have been a worn story. He should pick up a best actor in a drama nomination, and the show could also be in the running for a drama award itself. Streaming exclusively on Amazon Prime Video. The story of two people suffering psychological disorders who meet up during a pharmaceutical trial is by turns heavy drama, twisty sci-fi and dark comedy. Perhaps because it’s so hard to pin down, the show has been slow to gain traction, but awards season nominations for stars Jonah Hill and Emma Stone could change that. It’s now streaming on Netflix. Donald Glover may have come to audience recognition through the absurd comedy Community, but his roles of star, director and producer of Atlanta have cemented him as a force in the industry. The show swept through the award shows during its first two seasons, and this year should be no different. Expect acting, directing and best drama nominations from a slew of organizations. It’s streaming on Hulu. The absurdist comedy The Good Place may have been just what we needed most in 2018. If you’re not already watching this comedy about four people who find themselves in the Good Place (heaven) and then discover they were actually in the Bad Place (hell), you’re simply not doing your TV viewing any justice. Stars Kristen Bell and Ted Danson and the show itself are all nominated so far, and more nominations should be on the way. Streaming on Hulu.